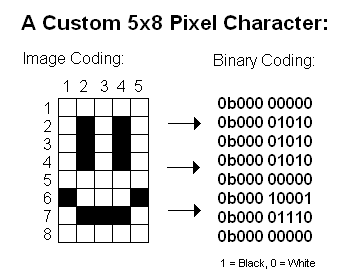 So you have been using an LCD for sometime and now have the need to create a custom character / symbol... How do you do it? Before getting onto it, lets understand how an LCD displays characters. If you notice, each character on a LCD display typically is inside a small 5 Rows x 8 Columns array of dots. Depending upon the character to be displayed, the required dots are turned On / Off. Most LCD's come pre-configured to display standard characters. Each character has a definition matrix, which defines which dots are to be On and which dots are to be Off. Here's how we will define a BYTE variable to hold the definition for the above Character. If you look at it the first row above is stored in the 0th index of the array mySmiley. // Write out Smiley Character. Now Lets to try to modify the above program to create a set of characters that can produce a BAR Graph with 8 different levels. Now lets use the bar graph characters to indicate sensor value. We shall use the value of the LDR on the Induino R3 board and try to represent it using the Bar Graph. Now Having a static Bar is not much fun, lets convert this into a realtime BAR graph. A Running Bar Graph based on the last 16 values of the sensor. 16 Values as we can display only 16 characters per line. // if count is greater than 16, we need to push out the oldest of the values and add the latest value to the set of 16 values. nice but how to print present time and date in lcd ?